Premium has earned 4.5 STARS and is RECOMMENDED. In conclusion, although the kit includes just a single battery, we found the Premium PR110 Electronic Cigarette Kit provides good value for its $49.95 price. If you are one of the many shoppers who have recently bought a disposable e-cigarette from a local 7-11, it is likely that you bought a Premium Electronic Cigarette. Premium has done an impressive job of establishing a widespread recognition of its brand by marketing these products directly through physical retail shops, media companies, wholesale dealers and even social networking giants such as YouTube, Twitter, Facebook, Digg and others. We became solid in our convictions that this brand merited further consideration and a genuine and in-depth review after having visited their website. There are many different starter kits that Premium produces, each of which vary primary based upon the actual size of the unit and the number of included cigarette-style batteries. 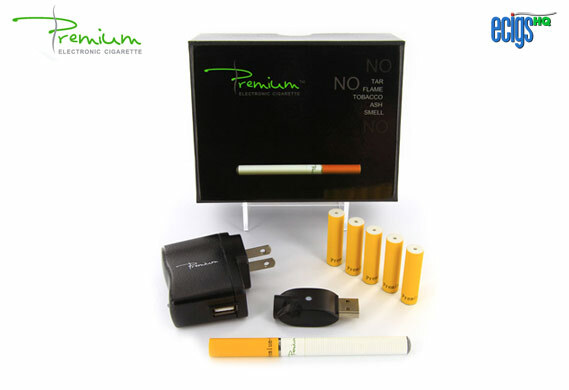 We opted to buy the Premium Electronic Cigarette Kit PR110 with just one included battery, given its low price of $49.95. This kit additionally contains a user manual, an AC adaptor for wall outlets, a USB charger and 6 cartridge/atomizers of the buyer’s choosing in both Nicotine level and flavor (24mg Tobacco was what we opted for). Given that we chose the option for free shipping, we were delighted to be in receipt of the kit within one week of having placed the order and decided to start the testing process right away. Upon opening the kit we found a felt-lined tray in black that held a single cartridge/atomizer and the cigarette-style battery. Beneath this we found five additional cartridge/atomizers that were double-end capped and sealed for freshness as well as the AC adaptor bearing the premium logo and the USB charger. The 2.75” cigarette-style battery comes in white. More costly starter kits from the Premium PR111 line have a longer batter. Longer batteries will last through approximately 75% of the cartridge atomizer, making it a more desirable power source when smoking heavily. The smaller battery that we bought is able to provide power for half the life of one cartridge atomizer. Not only are the cartridge/atomizers foil sealed for optimal freshness, but they are also individually labeled according to their Nicotine level and flavor, which is a major plus for us, given that labeling can be extremely helpful for smokers who enjoy smoking different brands, Nicotine levels and flavors. Premium Cartridge/Atomizers can be purchased in Cola, Apple, Pear, Caramel, Strawberry, Irish Cream, Camel, Chocolate, Pineapple, Cherry, Blueberry, Watermelon, Grape and Red Energy Flavors and in Nicotine levels of 6mg (Low), 11mg (Medium), 16mg (High), 24mg (Ultra High) and None. Currently, five can be purchased for $13.50. There are no discounts for quantity at this time. After having fitted the white cigarette-style battery with a 24 mg Tobacco Ultra High cartridge/atomizer, we took a slow, deliberate drag. This produced a bright orange glow at the grey LED tip and we instantly experienced the anticipated throat hit that is associated with tobacco smoke, but which is much less common among electronic smoking devices. The rich, tobacco flavor had just a touch of an edge. An impressive cloud of misty vapor was exhaled — obviously more substantial than the typical volume. Another drag was taken. This revealed that the unit performed without the crackling and popping sounds that are common of lesser e-cigarette brands. We exhaled yet again, emitting a substantial white vapor plume as the quality tobacco flavor resonated in our mouths. After several additional drags produced the same effects, we disconnected the cartridge/atomizer from the battery and chose to resume the testing process on the next day. We left the Premium Electronic Cigarette to charge throughout the night, using the AC wall adaptor and USB charger. On the following day, we were delighted to discover that the unit performed again just as it had in previous testing — providing a desirable flavor, enjoyable throat hit and impressive vapor. Premium had certainly produced a formidable e-cigarette. The cost of maintaining a single pack-per-day cigarette habit when using Premium was estimated to be approximately $2.84 per day, $19.91 weekly, $86.29 monthly or $1,035.45 each year. In comparison, this same habit will cost a bit more to maintain when smoking tobacco cigarettes which commonly cost $6 for every pack or $42.12 weekly, $182.50 monthly or $2,190.00 yearly, making it possible for Premium users to save about $1,154.55 each year. Premium has earned 4.5 STARS and is HIGHLY RECOMMENDED. In conclusion, although the kit includes just a single battery, we found the Premium PR110 Electronic Cigarette Kit provides good value for its $49.95 price. Click on the link below to visit the official Premium website. 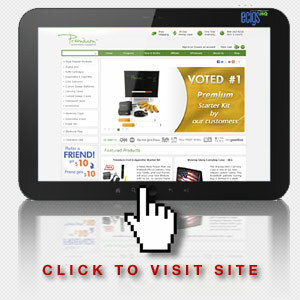 Enter the term TOP5 in the box marked Coupon Code in order to receive a 5% discount on your order with Premium.